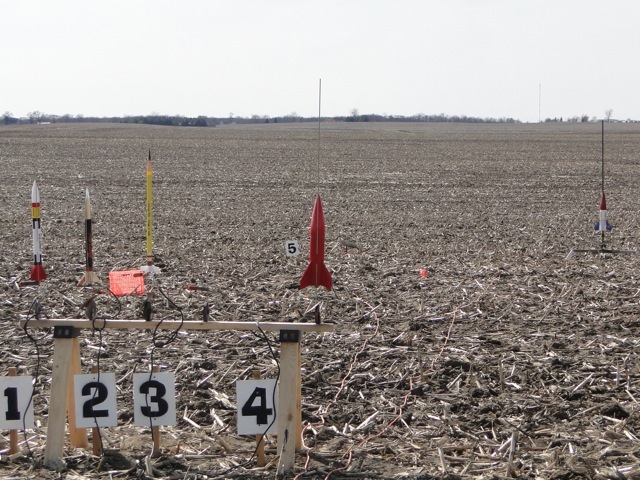 Today was the first launch day for the Willow Hill Rocketry Group since October’s launch. It was a cold day, with much standing besides the bigger cars to avoid the wind. 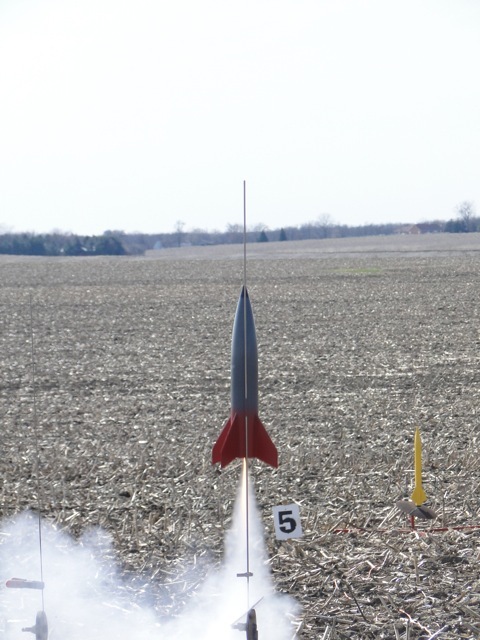 Jacob and I had our maiden launches of our rockets, and we where the second and third lunches of the day. We both had A8-3 motors. Jacob’s Wizard got some good height, but my Patriot was too heavy for that size motor. I did get closest landing to the orange create (in background) and thus win a prize. There were 25 launches today, one miss-start, and one in-air engine failure (fire out both ends of rocket). I fired my Patriot Rocket two more times, with B6-4 motor’s and the flights were better the the A8-3 flight that barely went 10 meters into the air. 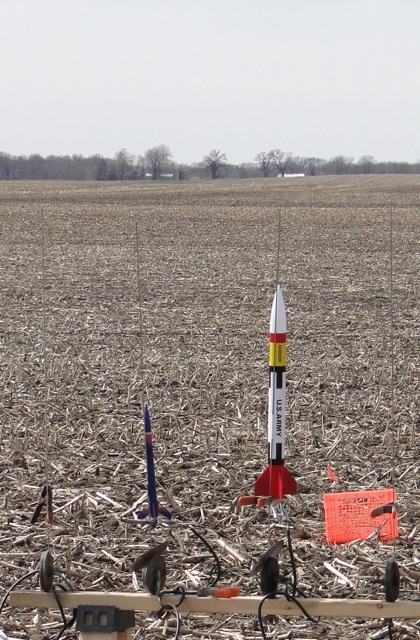 The rocket on the far right was the one that had the engine failure mid air. Not many pictures due to camera failure, will post video, if I find any non-damaged ones. A few weekends ago I was testing my new SageTV setup with my laptop. I had the network in one configuration, and I wanted to move things around to get better reception. Before I moved the server and aerial, I took the Powerline device to different rooms in the house to test. I ended up only getting 9.4Mbps in other rooms. I then noticed my laptops Ethernet connection was at 10Mb, assuming something was wrong I forced it to 100Mb full duplex and only got 17Mbps throughput. Assuming this was due to some cross circuit performance problem I tested around the house, and ended back in the office, and with my laptop on the same 100Mb switch as the server, I was still only getting 17Mbps. After banging my head for a while I put the network connect back to auto detect, and plugged the laptop back into the power cord and ta-da, 94Mbps to the server. Thus for my Dell Latitude E6400, with Windows 7, on battery, the Ethernet runs at only 10Mb. I remember Windows XP having an option for reduced Ethernet speed on battery, but cannot find it under Windows 7, it just seems to always be on. Thus now with power cord in hand, I found that the room I wanted to place the server gets 45Mbps to the TV, so I proceeded to move everything, and over-the-air TV is wonderful. The new UI change in iTunes 10.1.2.17 had me tripped up, as the download button has been removed from non-downloaded podcast. Thus if you have frequent updating podcasts, and there is a gap, under the old system you could click the download button. The red arrow shows where the button used to be. 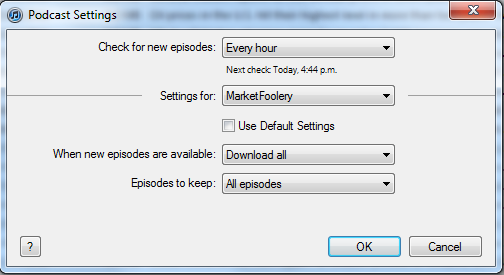 There is now per podcast subscription settings, but the “download all” option which will fill those gaps, will also delete each podcast as it’s listened to. Well today, I discovered you can just double click on the missing podcast, and it auto downloads. [Update: One day later] The new 10.2.0.34 release has the buttons back.